Drawing Inspiration For Your Next Event! The holiday season is always such an exciting time of year, there is a festive quality to almost everything and that especially shines through in some of the decorations we see. 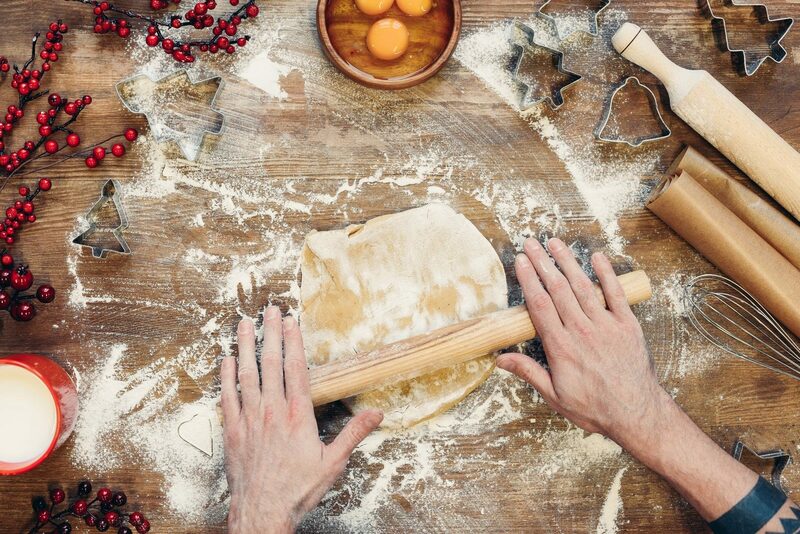 One of the iconic pieces of decor seen around this time are Gingerbread Houses, but this list isn’t of just any gingerbread houses, these are some edible structures you’re going to have to see to believe and maybe spark some inspiration for some creative decor at your next event! This edible wonderland is closest to home for us at National Event Pros. The sprawling gingerbread village at The Sheraton Hotel in Downtown Seattle is truly a city within a city. 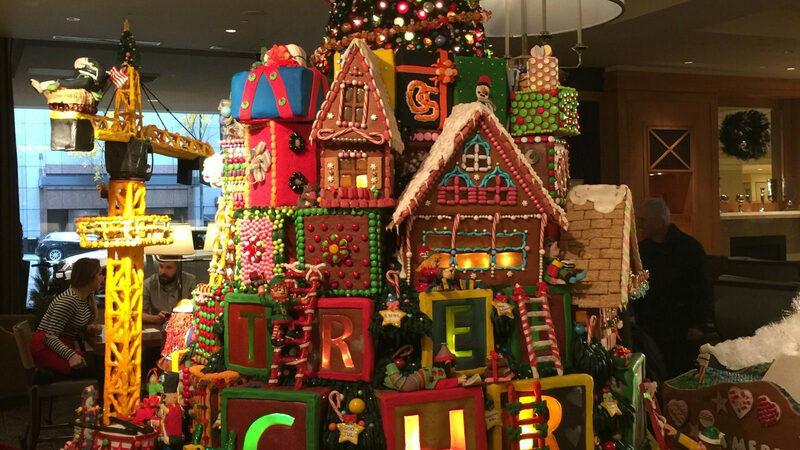 This beautiful edible display is part of a 25-year long tradition for the Sheraton and the gingerbread village is constructed each year benefiting The Juvenile Diabetes Research Foundation. Seattle’s best culinary professionals, artists, and even architects come together each year to create some serious candy magic from edible Seattle landmarks, iconic movie characters, and everything else in between. Each year the gingerbread creations are unique and equally mindblowing each time. The Sheraton’s gingerbread village even has light up and moving edible pieces as well, proving that this jaw-dropping display is not only a culinary masterpiece but an edible engineering marvel as well. Another part of the Pacific north-west we service is the always creative and fun Portland. Portland is home to many amazing attractions especially during the holiday season but few are as eye-popping and mouth-watering as The Benson Hotel’s annual gingerbread castle. This edible masterpiece is crafted by culinary chef and artist David Diffendorfer. David has been creating these show-stopping works of culinary perfection for well over 20 years at The Benson and every year he transforms over 50 pounds of gingerbread, 10 pounds of chocolate, and 32 pounds of marzipan into an edible winter wonderland for all to enjoy. Of course the folks up north know how to throw a festive winter wonderland bash. The Hyatt Regency in Downtown Vancouver has been curating its collection of larger than life culinary delights for 27 years now. 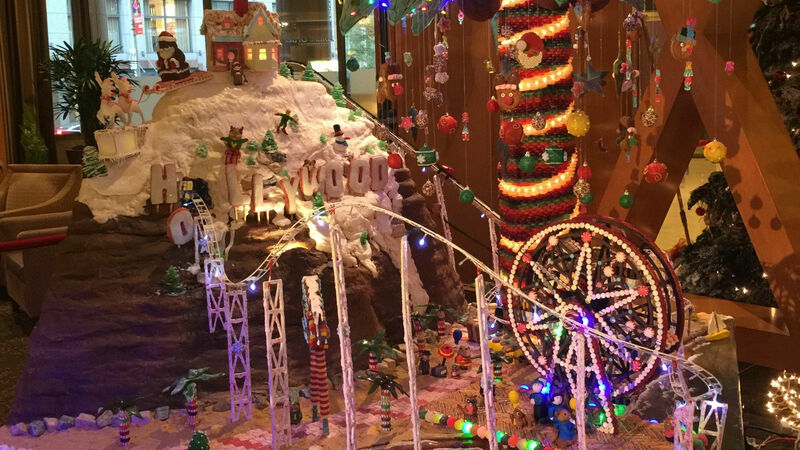 Over the years Gingerbread Lane at the Hyatt has raised over $80,000 for Make-A-Wish BC & Yukon. This is not only a fun and festive event for all ages but for a great cause as well. 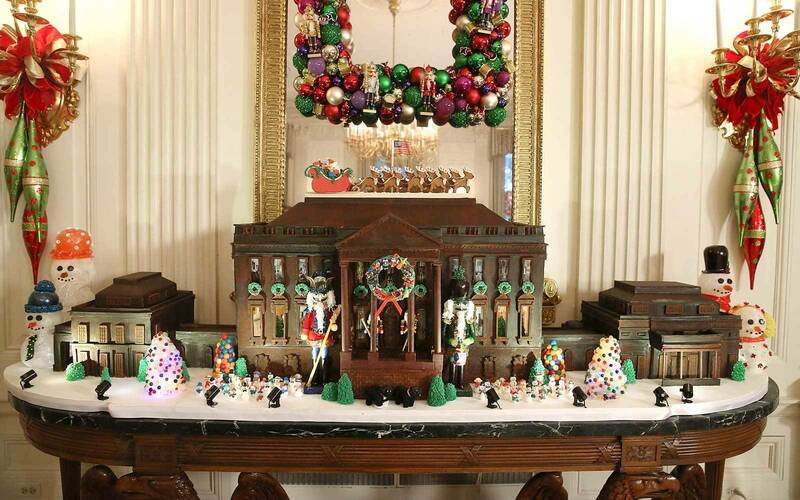 Christmas and the holiday season has always been big at The White House. Steeped in tradition the construction of the annual Whitehouse gingerbread house has been going on for as long as anyone can remember. The White House anticipates almost 68,000 guests to pass through it’s historic doors each holiday season so every year decorations are elaborate and eye-catching. For every president, there is always a different take on the classic edible structure. Last Christmas’ at The White House was hosted by the Obamas and their gingerbread house came out to be about a whopping 475 pounds. 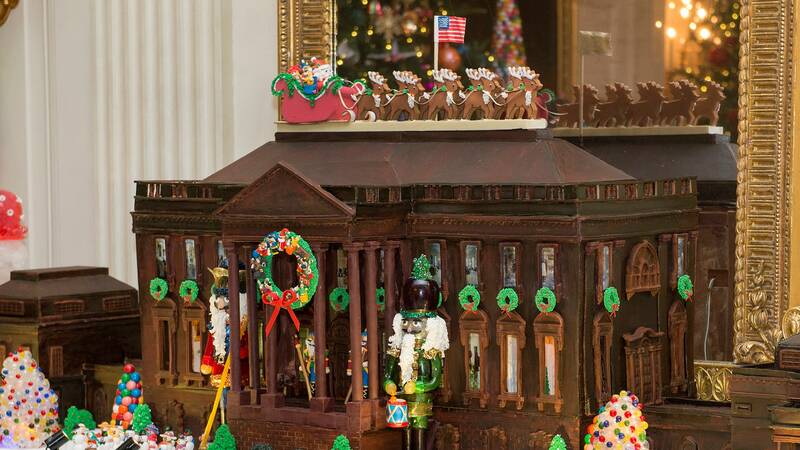 They picked out a chocolate covered replica of The White House that was handcrafted by Susan Morrison, the world-renowned and former white house pastry chef. 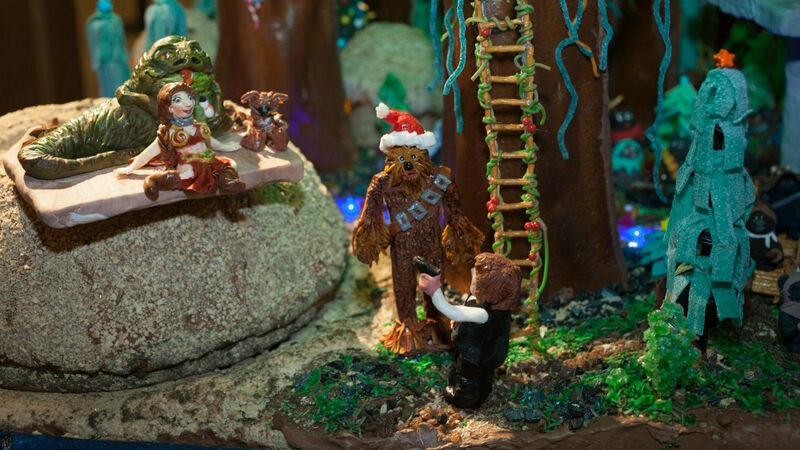 Susan’s masterpiece took a total of about 250 pounds of gingerbread dough, 150 pounds of dark chocolate, 25 pounds. of gum paste, 25 pounds of handcrafted candy cane poles, and 25 pounds of icing. 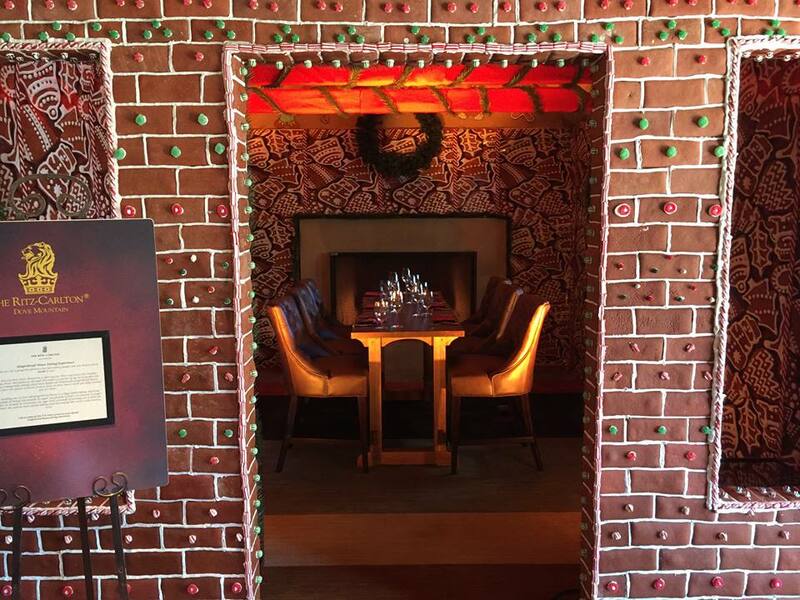 This particular gingerbread house is unique from all the rest of the structures on this list because guests of The Ritz Carlton at Dove Mountain can not only enjoy looking at the edible masterpiece from afar, but they can wine and dine inside the house all holiday season. The dine-in gingerbread house isn’t the only unique edible structure that The Ritz Carlton at Dove Mountain has in store for its guests. A unique holiday season addition but perfect for those who live in the sunny weather of Tucson Arizona, the resort has a candy cacti garden. 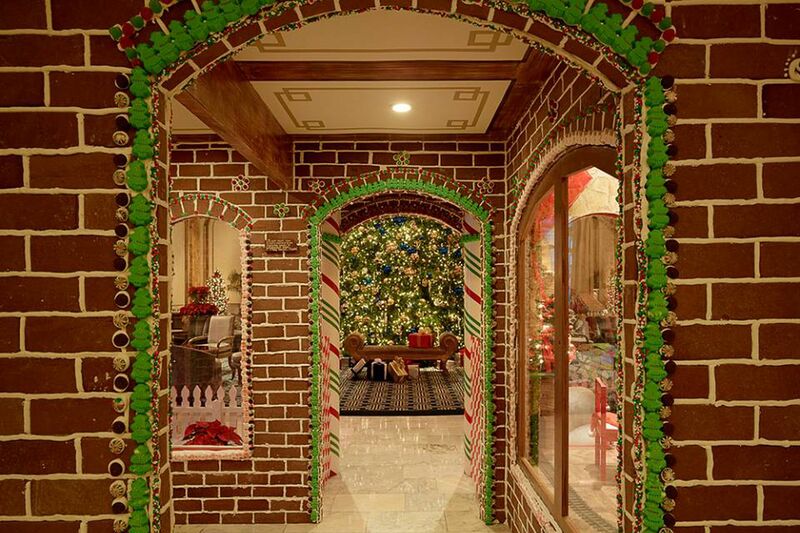 This gingerbread house at first glance looks like an elaborate holiday addition to The Ritz Carlton Hotel in New Orleans, but it’s, in fact, all 100% edible. From the white marble walls to the exquisite gold detailing on the crown molding, this gingerbread house is truly a masterpiece. The gingerbread mansion was created to replicate the ‘wedding cake house’ on which is a historic landmark located on St. Charles Avenue, in New Orleans. 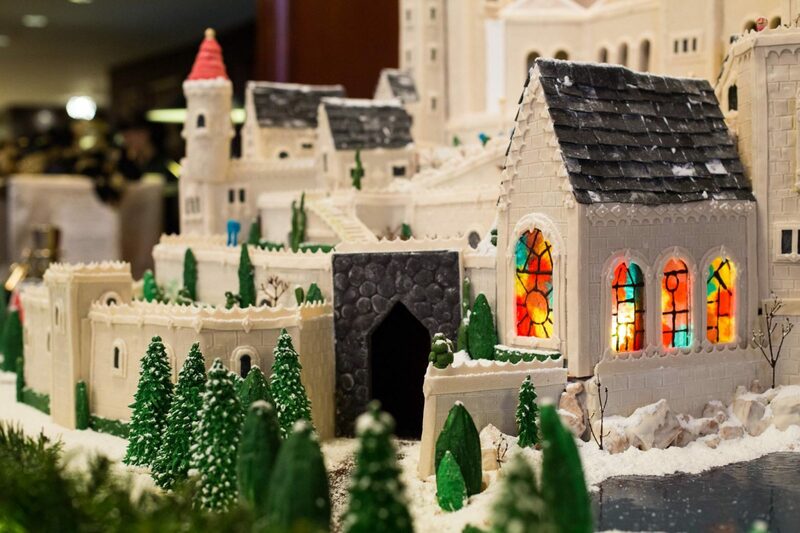 The construction of this edible mansion takes an entire team of talented culinary experts and artists, as well as approximately 390 pounds of gingerbread dough, 134 pounds of decorative fondant, 44 pounds of gum paste, 209 pounds of royal icing, 30 pounds of delicious chocolate, and about 10 pounds of piping gel. Thats a whole lot of sugar for one mansion. 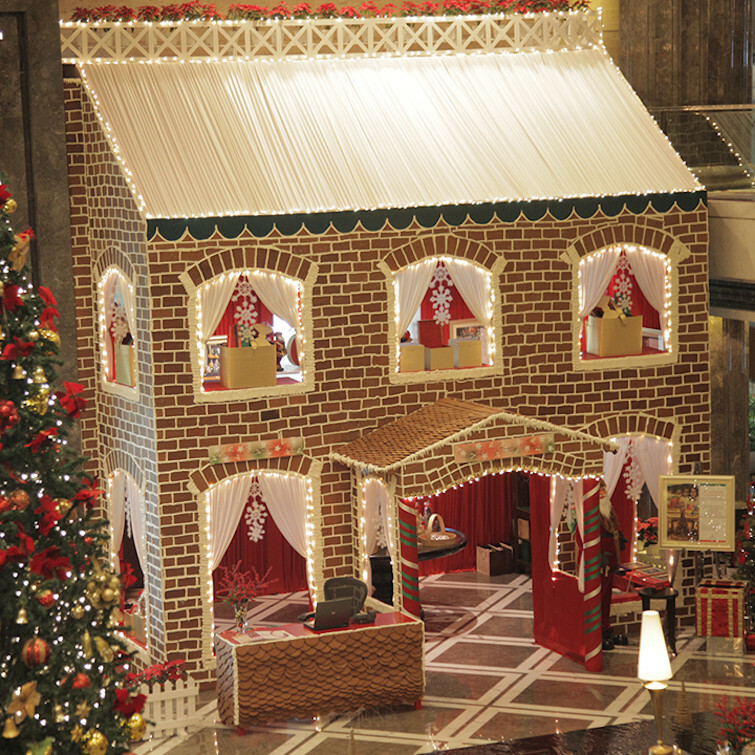 Across the oceans and as far east as Mumbai India, the holiday cheer can be seen stacked two stories tall with this gingerbread house creation.The Leela Palaces, Hotels and Resorts of Mumbai is the host of this jaw-dropping culinary creation and it sits directly in their main lobby where guests can check in with the concierge. 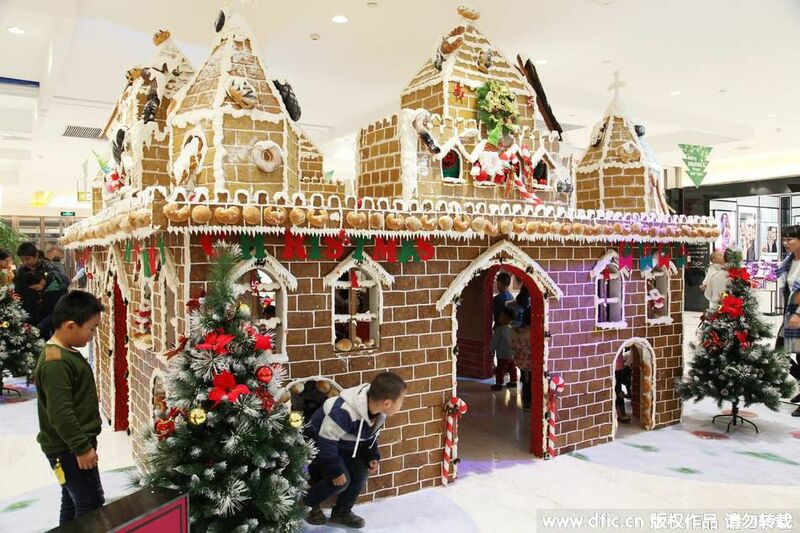 Even China has their own magnificent cookie castles like this gingerbread house that was created in a local mall in Xi, China. The structure stood a whopping 700ft tall and about 20,000 cookies were used to create the edible masterpiece. 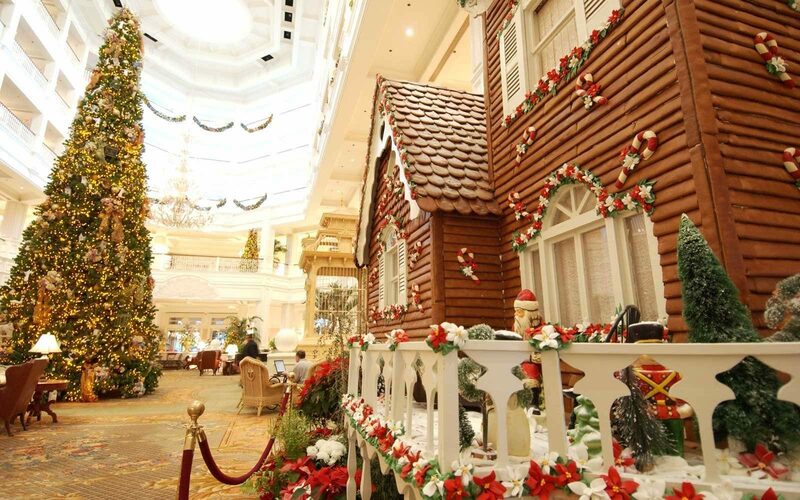 The best part about this cookie castle was that guests were invited to explore inside the gingerbread house itself. Making holiday shopping that much more magical for people of all ages. 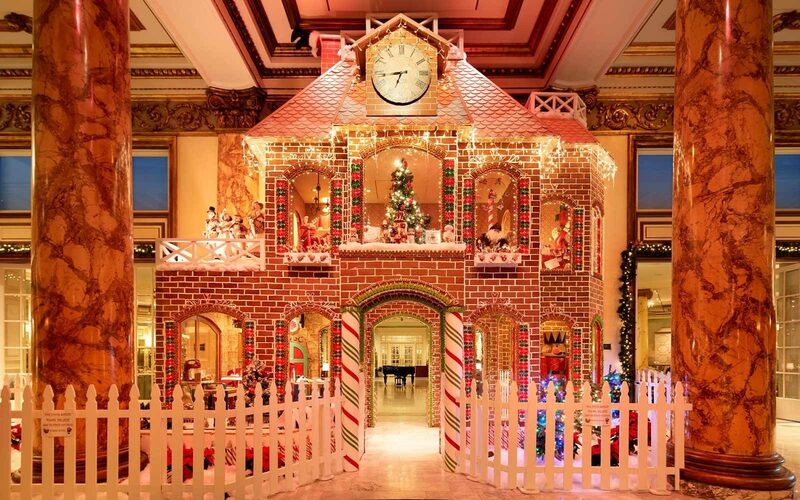 This eye-catching two-story gingerbread manor which comes in at about 22-feet high and 23-feet wide can be found in the lobby of The Fairmont Hotel in San Francisco. From thousands of real gingerbread bricks, candy canes, buckets of frosting, and marshmallows, this gingerbread manor has all the amenities including a fully functioning gingerbread railroad and even a dog-friendly version of their human-sized gingerbread manor. Truly not a single person or pup gets left out of the holiday festivities when you check into The Fairmont in San Francisco. Last but certainly not least, is quite possibly the grandest gingerbread creation to rule them all. The Gingerbread Bakeshop at Disney World in Orlando Florida year after year pulls of this magical edible transformation all around the park. 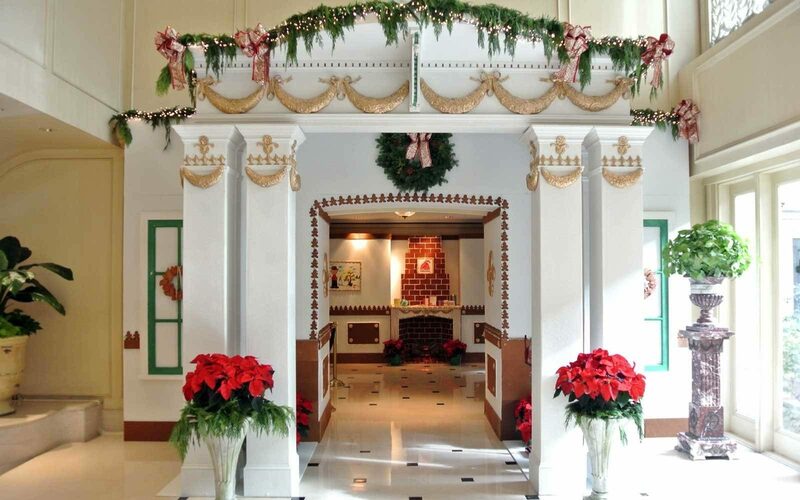 The Bakeshop itself sits within the lobby of The Grand Floridian Resort is made entirely of gingerbread and candy. It is here where they create all of the holiday confections for the entire park and resort. Guests can stop by admire the culinary creations as well as grab a sweet treat to eat. 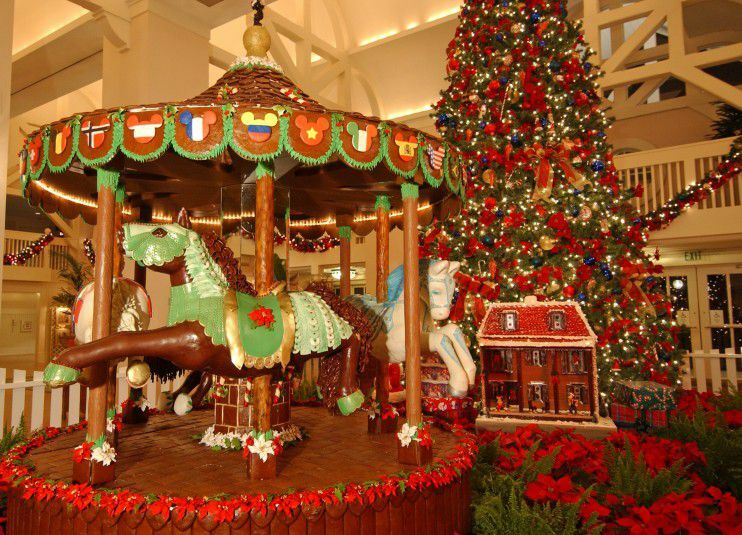 Disney’s Beach Club Resort is also hosting to a life-size fully functioning chocolate and gingerbread carousel. Bringing the Magic To Your Next Event! It’s never too late to bring the magic to your next event. Wheather it is creating a winter wonderland with our commercial grade snow machines, hosting an ice bar in a festive pop-up pub, or decorating cookies of your very own.